This is a lovely pair of Clarice Cliff Blue Japan conical salt and pepper shakers. Both of the shakers have a Made In England back stamp. The colours are bright and bold. Both shakers are in good condition with the exception of a small chip to the bottom rim of the salt shaker, and also both of the bungs are missing. 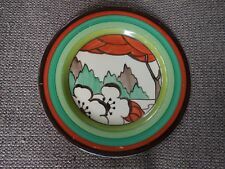 This is a lovely example of original Clarice Cliff in a rare design - stunning! Clarice Cliff Limberlost Tea Plate - Stunning! This is a lovely Clarice Cliff Limberlost tea plate. The plate has the Fantasque Bizarre by Clarice Cliff Newport Pottery England back stamp. The colours are bright and bold. This is a stunning piece of original Clarice Cliff, which would make a great addition to any collection. This was made by Clarice when she worked in the Newport pottery in England in the 1920's. This plate is stamped and signed by the artisan Clarice Cliff. This is a superb antique plate handmade and hand painted by the world renowned potter and artisan Clarice cliff. FOR SALE A CLARICE CLIFF AUTUMN CROCUS TANKARD MILK JUG. Z O O O OM……… . To the base of each piece is a stamp reading ‘Marguerite, Hand Painted, Bizarre by Clarice Cliff, Newport Pottery, England’. Six of the pieces have ‘Marguerite’ handwritten in black ink. Two have a ‘Marguerite’ stamp. Lovely clarice cliff vase, excellent condition. 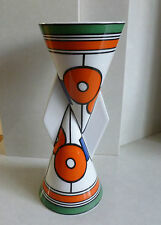 For sale here is a beautiful Clarice Cliff limited edition Yo-Yo Vase entitled "Circles & Squares". Produced in Wedgwood earthenware this vase is much sought after. but has light crazing on the back of the vase paintwork. A pretty little cake stand with blue poppies painted and a tree very much in the Clarice Cliff style but it is not marked Clarice Cliff. There are some markings which have tried to show in the photos but I have been unable to identify them through research. It does show some wear commensurate with age hence the low starring price but it's a pretty little plate. It has a sort of mottled orangey brown background and there is some gold edging which is a bit worn in places. This Clarice Ciff Vase bizarre "My Garden" design is gorgeous. The base is signed Clarice Cliff, Bizarre, My Garden, HAND PAINTED, Wilkin Son Ltd, ENGLAND & 670 (shape no.). This genuine Clarice Cliff antique vase dates to the 1930's. CLARICE CLIFF. MILK JUG - H65mm x W140mm. "TEA FOR TWO". LIMITED ADDITION. WITHOUT ANY. IN EXCELLENT CONDITION. Reducing my collection of Clarice Cliff ceramics. It weighs 158g. Clarice Cliff Bizarre Fantasque Small Milk Jug. Odeon . Excellent. Clarice Cliff Bizarre Fantasque Stamford shape Small Milk Jug. No hairlines or restoration.Brilliantly assured hand painted in yellow to black. Wonderful colours. Fantastic design. Small paint rub and tiny shallow chip to spout. See pictures. A fantastic clarice cliff coffee set 3 pieces, tea pot, sugar and creamer jug From the art deco bizarre range Pattern is Rhodanthe In good period condition... with some age related wear... coffee pot lid has chip to corner... milk jug has sml chip and hairline crack to back... displays well and are not really issues Fully marked underneath with bizarre and registration marks Coffee pot measures approx 7" high x 6" no major damage to painted design.some age related wear..see pics Displays brilliantly... Perfect for a collector or for interior display Please ask any questions.. Will.be v well packed for postage or collection is possible. Antique 4 pices WILKINSON ENGLAND Honeyglaze Hand Painted. Marked on the base WILKINSON ENGLAND. HONEY GLAZE HEXAGONAL BOWLS C.1930'S. Hexagonal Dishes c.1930. with dark black rim inside and outside as well. Clarice Cliff Limberlost Rectangular Plate - Stunning! This is a stunning Clarice Cliff Limberlost rectangular plate / dish. The colours are bright and bold. The plate has the Bizarre by Clarice Cliff Wilkinson Ltd England back stamp, along with the Biarritz Royal Staffordshire Great Britain back stamp. Clarice Cliff Rhodanthe Pattern Bizarre Pottery Shallow Dish Art Deco. "Clarice Cliff Art Deco Rhodanthe Pattern Pottery Bizarre Oblong Shallow Bowl ". Maker : Clarice Cliff. Marks : "Wilkinsons England" "Honeyglaze" "Newport Pottery Co England" "Clarice Cliff" all stamped. Clarice Cliff Style. 2 matching Lidded serving dishes, cream with green foliage and orange poppy flowers. Stylised flower lid handles. Also decorated to base. A tiny dint to lid of one. See photos. A fantastic clarice cliff Sq plate Part of the Biarritz dinner service ranges From the art deco bizarre range Pattern is Rhodanthe In good period condition... chips to rear of 2 corners..see pic... doesn't show when displayed. Some natural crazing to glaze. Fully marked underneath with bizarre and registration marks measures approx 9" x 8" Displays brilliantly... Perfect for a collector or for interior display Please ask any questions.. Will.be v well packed for postage or collection is possible. Clarice Cliff was an English ceramic artist active from 1922 to 1963. She began as an apprentice potter. Remorse reason (Change of mind). FOR SALE A CLARICE CLIFF AUTUMN CROCUS FROG / FLOWER HOLDER. A fantastic clarice cliff tea set 3 pieces, tea pot, sugar and creamer jug From the art deco bizarre range Pattern is Coral Firs In superb period condition... see pics Fully marked underneath with bizarre and registration marks Tea pot measures approx 6" high x 8" No chips cracks... no major damage to painted design...see pics Displays brilliantly... Perfect for a collector or for interior display Please ask any questions.. Will.be v well packed for postage or collection is possible. A Clarice Cliff leaf shaped plate with flowers and berries design. It features her mark and that of Newport Pottery to the base. This is a lovely Clarice Cliff Pink Pearls rectangular dish. The large dish has the Clarice Cliff Newport Pottery England back stamp, along with The Biarritz - Royal Staffordshire Great Britain back stamp. FOR SALE A CLARICE CLIFF CROCUS JARDINIÈRE. FOR SALE A CLARICE CLIFF AUTUMN CROCUS 16 CM CORONET JUG. Z O O O OM……… . Clarice Cliff Bizarre Wilkinson plate. As can be seen from the photos - the paintwork is rubbed and there is a slight back rim chip that has been filled. Clarice Cliff 'Fantasque' Bowl. A Clarice Cliff ‘Fantasque’ Bizarre Bowl. Black printed Newport factory mark to base. Part of my late mothers pottery collection. Clarice Cliff Crocus - Windsor Pattern - Spring Trio & Sungleam Cup with Spring Saucer. Spring Plate: good - slight wear (three tiny scrapes to the central green circle and one small (2 mm) scrape to the green rim) - small (7 mm) chip on the underside of the rim (1 mm visible from top side) - no cutlery marks - glaze bright - no crazing. FANTASTIC CONDITION, SUPER SET. FOR SALE A CLARICE CLIFF AUTUMN CROCUS ATHENS TEA TRIO. Clarice Cliff - Newport factory. A fabulous Art Deco bowl by the World renowned Clarice Cliff. Pattern - Secrets. Hand painted in brown, green and yellow colours. Condition - Good. The paint in places is slightly scuffed, particularly to the interior green band. Dish, 19.5cm x 17cm x 2cm. Lid Cover, 14.5cm x 11.5cm x Tapered 7cm to 4cm with Handle 2.5cm. It weighs 615g. This is a lovely Clarice Cliff Sunrise coffee cup and saucer. Both the cup and saucer have the Fantasque by Clarice Cliff Wilkinson Ltd England back stamp. This is a lovely piece of original Clarice Cliff in a rare design. No 840076. Clarice Cliff Newport Pottery. Lidded Tureen. In very good used condition. FANTASTIC SIFTER. FOR SALE A CLARICE CLIFF "PETER PAN " CONICAL SUGAR SIFTER. HEIGHT 14 CM. FOR SALE A CLARICE CLIFF AUTUMN CROCUS ATHENS TEA DUO. A Clarice Cliff Bizarre 'squat for' bowl with banded motif. Clarice Cliff Bizarre Bowl. Rubbing, scratching and wear to decals and interior. Printed Newport Pottery factory marks to base. This is a beautiful Clarice Cliff Bizarre Plate in the Clytia pattern. Dating to the 1930's. Lovely Clarice Cliff Orange Trees And House Tea Plate - Stunning! This is a lovely Clarice Cliff Orange Trees and House tea plate. The plate has the Fantasque by Clarice Cliff Wilkinson Ltd England back stamp. The colours are bright and bold. The plate is in reasonable condition with some marks and paint loss in places, along with general wear. The plate displays well. This is a stunning piece of original Clarice Cliff in a sought after design. Blue and Cream Teapot in the Blue Rhodanthe design on the ribbed Lyndon shape. In very good condition no clips or cracks visible. 3 1/4in high by 7in long and 5 1/4in round Base Stamp - Wilkinson Ltd England and L2 in green paint. The number 36 is for pottery use and indicates how many will fit on the firing tray.